Israel has been getting some much-deserved attention for its relief efforts in Haiti, as well as the usual small-minded aspersions. While most of the reports on Israel's rapid deployment to Haiti, following the devastating 7.0 magnitude earthquake that leveled Port-au-Prince and killed thousands, have been positive there have been some that have rushed just as quickly to say that Israel's efforts were nothing but a PR stunt. A few crackpots have even suggested that the earthquake was a man-made attack by the US and Israel. That sort of nonsense obviously doesn't deserve a response. Israel's forté, earned through the blood of her injured and killed soldiers and civilians, is battlefield trauma aid and logistics. That an Israeli IsraAid team is able to arrive at a moment's notice with doctors and equipment is something which we can take pride in, however, not at the expense of others who have also been doing what they can. Look, we have doctors; we have state-of-the-art medical equipment (we invented much of it) but that should in no way diminish the contributions of other countries. Both the detractors and the devotees need to keep things in perspective. While Israel's advanced set-up was impressive, there were other field hospitals; Cuba had several but they were handling basic first-aid (and amputations). Norway also had a small set-up with around 20 staff. 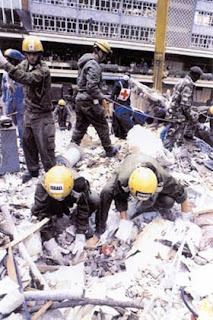 Argentina was able to provide immediate aid because they had a an medical station in Haiti before the earthquake. There were also a number of doctors already in Haiti whose three Doctors Without Borders aid stations were destroyed by the earthquake. I believe they joined up with the Israeli unit but I'm working on confirming that. Canada, for its part, dispatched two warships - the HMCS Athabaska and HMCS Halifax - loaded with humanitarian aid, as well as several military transport planes. I was in close touch with the Jamaicans, who were flying aid into Haiti and preparing to receive refugees (and I'm going to write more on Jamaica's efforts over the few days). It's worth remembering that a number of Caribbean nations provide on-going support to the beleaguered nation. They were there before the cameras showed up, and they'll be there, I expect, long after. That they can't provide the kind of high-tech care that Israel can provide is irrelevant; they do what they do and it deserves to be acknowledged. 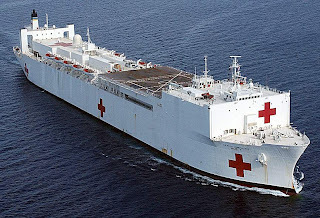 Criticism of the US (and other western states) has not been fair; they've been prepping the USNS Comfort, a massive hospital ship capable of handling hundreds of patients, which has just arrived in the region. The US could take the time to adequately prepare the ship (which includes a crew of 900, and helicopters for ferrying victims) because they knew the Israeli team would be there within hours (and the recon team was there before doctors arrived). And now that US (and Red Cross) relief is arriving en masse (and it should be noted, A French hospital ship, the Siroco, has also arrived), the Israelis, and other teams, will go home. In the words of one Israeli officer, "We provided timely medical care to about 1,000 people, we conducted 300 operations and delivered 16 babies. In the past few days the Americans arrived and then you can put things in proportion and become more modest in the face of their airlift and the scope of their aid. You need to understand that those who will continue to treat the main suffering there are the Americans." It's exactly this sort of cooperation between the US and Israel that highlights the importance of the relationship, a fact often lost on those who dwell on financial support or Arab intransigence. A bigger issue is the future of Haiti as a society, as a people. The earthquake was really just rubbing salt in the wound of a place already knocked down time and again. Haiti, ultimately, isn't Israel's responsibility but everyone's, and how the world continues to support this place, after the cameras and temporary aid stations have packed up and left, will be the real test. Long after emergency teams have returned home, it will be countries like the US and Canada which will be providing long-term assistance to Haiti; indeed, Canada is hosting an international conference in Montreal today aimed at coordinating rebuilding efforts and to "physically get the Haitian government back on its feet." Haiti is already the largest recipient of Canadian long-term development assistance in the Americas and the second largest in the world. What's really been missing is a coordinating agency that assigns nations in emergency situations according to their special capabilities. This was recognized after the Tsunami in Indonesia in 2004, when poor coordination between international aid agencies resulted in surpluses of some supplies and equipment and acute shortages of others. That this sort of coordination is still not happening is yet another failure of the UN, which would rather spend its money (which is really G8 money) on canapés and Landcruisers. One can be proud of the Israeli team, and cognizant of the tremendous efforts of others; the two aren't mutually exclusive. In fact, I was told there were representatives of 30 countries (now numbering in the thousands) working in Haiti as of a few days ago. Many flew there on their own dime and are working with little support. That also deserves some praise. If not more. As for those who choose to diminish Israel's humanitarian work for partisan reasons (or the breathtakingly petty: "they're acting TOO proud! "), it really just points to a pathological need to sully the Jewish state, and an inability to proffer any sort of mature line of reasoning. Not the first time, either. Posted by Morey Altman at 1/26/2010 01:23:00 p.m.